The U.S. State Department has concluded that up to 10 European citizens have been tortured and killed while in the custody of the Syrian regime and that evidence of their deaths could be used for war crimes prosecutions against Bashar al-Assad in several European countries. The new claim, made by the State Department’s ambassador at large for war crimes, Stephen Rapp, in an interview with me, is based on a newly completed FBI analysis of 27,000 photographs smuggled out of Syria by the former military photographer known as “Caesar.” The photos show evidence of the torture and murder of over 11,000 civilians in custody. The FBI spent months pouring over the photos and comparing them to consular databases with images of citizens from countries around the world. The implications could be huge for the international drive to prosecute Assad and other top Syrian officials for war crimes and crimes against humanity. While it’s unlikely that multilateral organizations such as the United Nations or the International Criminal Court will pursue cases against Assad in the near term, due to opposition by Assad’s allies including Russia, legal cases against the regime could be brought in individual countries whose citizens were victims of torture and murder. Rapp declined to say which European countries’ citizens were found in the Caesar files, but said that there could be many more European and international citizens identified as the work to analyze the photos continues. Meanwhile, the drive to begin prosecutions against Assad and his cronies in European countries can now move forward. “We were hoping we were going to get hundreds of matches, but this is something to work with,” Rapp said. For Caesar and his support team, the hope is that European countries will see their citizens’ murders as further evidence that the West must reject any notion of allowing the Assad regime to remain in power or being a de facto partner with the West against extremist groups such as the Islamic State. “It’s incredibly important for the international community to treat the fact that Europeans were tortured to death by the Assad regime with the same seriousness that they treated the fact that two American journalists were beheaded for going inside Syria and covering the suffering of the Syrian people,” said Mouaz Moustafa, executive director of the Syrian Emergency Task Force, an American nongovernmental group that runs State Department programs inside Syria. Moustafa has been working with Caesar and served as his translator when he testified before the U.S. Congress in July. 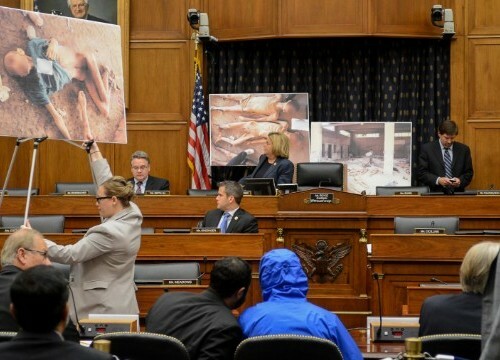 During that testimony, Caesar warned that more than 150,000 civilians were still being held in Assad’s jails and face the same fate as those whose deaths he was forced to photograph. In a statement to me, Caesar revealed that he has information that the systematic torture and murder of civilians in Syrian regime custody is ongoing, more than one year after he escaped. Caesar was a military police photographer in the Syrian Army who was tasked in 2011 with documenting the deaths of civilians in regime custody, by photographing thousands of bodies that had been tortured in the cruelest ways. In fear for his life, he escaped from Syria in 2013 with more than 52,000 images of torture and murder of civilians stored on thumb drives. The images show evidence of more than 11,000 civilian deaths in Damascus from 2011 to 2013 at the hands of the regime. Rapp and other international war-crimes scholars have said that the systematic way the murders were carried out and documented by the regime’s “machinery of death” is the worst seen since the Nazis. After escaping to Turkey with the help of some members of the Syrian opposition, Caesar struck a deal in which he turned over 27,000 of the images to the U.S. government. (Some can be seen through this linkvia the House Foreign Affairs Committee; but be warned: they are very graphic.) He gave the full tranche to an unidentified European country for safekeeping. He was then relocated with his family to a different European country and provided a small living stipend. The FBI, with State Department assistance, analyzed the photos in the U.S. government’s possession and found about 5,400 that had faces that could be reasonably compared to existing photo files, Rapp said. Some 4,800 of those attracted matches to files already in U.S. passport or visa databases, often multiple matches. FBI analysts then went through the photos to find matches with a higher degree of confidence. Rapp said there were probably many more matches in the Caesar file but there were limitations to the FBI’s analysis, because there wasn’t a lot of personal information to accompany the photos and because the bodies were often mutilated. “If you have other pictures of the same person, if you had an identity to go on, if you had other kinds of information, and if it wasn’t just putting up a simple picture of a cold dead body’s head and an old picture, you would probably find other matches that the computer didn’t even come up with,” he said. The FBI gave me a statement that it had not uncovered any evidence that indicates the photos were altered in any way that changed their meaning. (This is significant, as some Assad regime defenders and other critics have claimed that Caesar’s photographs were doctored or fraudulent.) Some of the text in the photos had been clarified, but the evidence of the torture and murder was real. When it came to the people in the photos, the FBI cautioned that more analysis would need to be done before the photos could be conclusively used to identify individuals. Rapp said the FBI’s statement was meant to be as cautious as possible. “That’s conservative on their part. There were some that looked similar but it’s very difficult to say definitively without things like fingerprints,” he said. The FBI statement also called on Caesar and his team to give the U.S. government the remainder of the 52,000 photos and the metadata that goes with them. Although the Caesar team has been working with the U.S. government, they have so far refused to give the FBI the second tranche of photos because they want the FBI to first issue a report that states with more certainty that the photos are real and authentic. Caesar and his team have also been working in a parallel process to analyze the photos and bring the evidence to the public themselves. Their effort has been hampered by a shortage of funding and what they perceive as a lack of international support. The New York Times reported that months after Caesar appeared in Washington and met with top White House officials, there has been little action to follow up on his revelations. The people helping Caesar think the Obama administration has been slow to follow up on the evidence and they are pleading for the U.S. government to give their project some financial support. Caesar and his supporters are preparing an investigative report on the evidence and plan to promote that report to UN member states. The team is also exploring opening investigations on the national level in the U.S., the UK and Spain. Caesar himself is nearly broke, unable to find work in his new host country. His trips to foreign countries to talk about his evidence have been funded out of the pockets of friends and supporters. “I am, like all other Syrians, a refugee of the war. My situation is better than those suffering inside,” he said. Rapp promised that the State Department will continue to fight for the evidence to be verified, exposed and then used to hold Assad and other regime figures accountable. Yet U.S. government is increasingly divided between those who want to confront Assad now and those who believe that he is still needed to negotiate an end to the civil war and ensure that Islamic extremists don’t rule Syria. Caesar’s evidence forces those inside the U.S. government who want to preserve the Assad regime to confront the horrible costs of that Faustian bargain, measured in innocent human lives. As Americans come to grips with its past torture of dozens of prisoners in U.S. custody, the question remains whether the West will act to stem the murder of thousands in Assad’s custody. Now Europeans will have to to confront the reality that their citizens are among them.